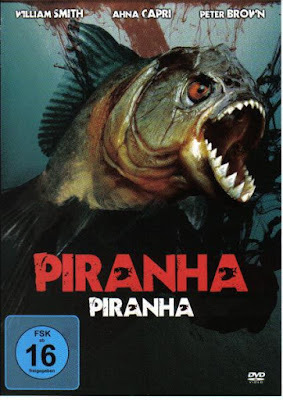 Not recommended for anything other than a riffing party, PIRANHA (not the Joe Dante film) is one of those films that will have you talking to the screen in complete disbelief. Its not so bad its a good film, its just a bad film that will get the comments flying. The plot of the film has a nature photographer and her brother going into the jungle with a guide. At a local bad they meet a man called Caribe (Willim Smith the only name in the cast) who is a hunter. Smith has the hots for the woman and as the relationship deteriorates within the group he plots to carry the woman off. Positively mind boggling the film has long shots of people traveling and of animals, an awful song, a motorcycle race and no piranhas. Well one person is killed and dumped in a river but they fish do not figure into the plot in any way. There are no thrills because there is no tension because nothing happens that's remotely exciting until the last half hour. Make no mistake this is an awful film- but if you can get your friends together and watch with with the intention of making fun it's a great deal of fun.